Easter : Val's Articles, Musings and Stuff! About mid-October, a few short weeks after I started kindergarten, the teacher announced that parent-teacher’s night was coming up soon. She told us that she was going to give us a picture to color and that we were to make it very special for our Moms and Dads to see when it was posted on the bulletin board for that special event. I was so excited! I loved colouring and I loved a challenge, so my little mind immediately went into high gear thinking of ways that I could make my picture extra special. Now, when each person in your class has the same page to color and the same selection of colored crayons, it is not an easy task figuring out what to do to make a picture extra special. At last I hit on the perfect plan. I would color everything the wrong color. And to add that extra special touch, I would color slightly outside the lines and try to blur the colors together. Tongue sticking out the side of my mouth, I diligently applied myself to my task. It wasn’t easy. The picture we were to color consisted of a barn with a fence around it, a tractor, a pile of straw, a tree, two cows, three chickens and a pony, a grassy pasture and fluffy clouds in the sky. I had six colors in my package of crayons. Red, green, blue, yellow, brown and black. It took a lot of planning in order to get all the colors wrong. I worked at my picture long after the other kids had moved on to reading circle or play time. Finally, my masterpiece was finished! Absolutely everything was the wrong color and every single line had been blended over the line into the next color. I was so proud of myself. I could hardly wait for my Mom to come and see what a special picture I had made for her. The evening of the open house, my Dad stayed home to babysit my brother and myself. Mom trotted happily off to the school, which was only a block away from our house. I could hardly wait for her to get home. I giggled, sang songs to myself and was so excited that my Dad had to send me outside to burn off some steam playing with my skipping rope. At last Mom came home. I could hardly contain myself waiting for her to come through the door. By this time my Dad was beside himself with curiosity about what I had done, because I hadn’t told a soul about my wonderful picture. Mom came through the door. I threw myself into her arms expecting to hear her words of praise. Instead, I felt her pull away slightly. Her face was downcast and she looked very upset. Dad asked her what had happened. She started to cry, and then she told him about the picture. She told him that all the other kids had colored nice pictures, and that my picture stood out like a sore thumb beside them. Some other mothers had laughed at my picture. Mom was devastated. She turned to me and asked me why I had made such an awful picture. She said: You know your colors and how to color within the lines. What were you thinking when you messed up your picture like that? Now it was my turn to be devastated. I was in a state of shock. I had no idea that I had done anything wrong and it made me sick inside to think that I had disappointed my mother. I cried so hard that I could hardly catch my breath. My poor father stood around not knowing how to deal with the two, very upset women in his life. What chaos! Mom was crying, I was crying, my brother went upstairs and shut himself in his bedroom, and my poor Dad had no idea what to do. He finally carried me up to bed and sat with me until I had cried myself to sleep. After I fell asleep, I’m sure he went downstairs and made my Mom a cup of tea until she calmed down, too. When I got up the next morning I felt so ashamed of myself for making my mother cry. I was ashamed to think that people had laughed at my picture. I was ashamed that my mother had been ashamed of my picture. My Mom tried to make things right by saying that my picture certainly was special, and now that she understood why I had colored it that way, she told me that I had indeed done a spectacular job. I would not be consoled. Rebellion entered my childish heart. I refused to accept my mother’s conciliatory overtures. I refused to go to school. I refused to play with my toys or listen to my records on the little player I had in the living room. All I would do was sit outside and play on the swing, nursing my anger, my hurt and my bruised ego. My mother was wise enough to leave me there for as long as I needed, ever keeping a watchful eye on me out the window. She called me in to lunch, which I reluctantly accepted. When I still flatly refused to go to school (I was enrolled in the afternoon kindergarten class) she wisely said that perhaps I might like to spend the afternoon with her and she would read me some stories. Gradually I came around and gratefully fell into bed exhausted that evening. The Hebrew word that is translated “ashamed” means “to fall into disgrace, normally through failure, either of self or of an object of trust”. Now, coloring a picture with all the wrong colors is not a disgrace, nor is it something to be ashamed of, unless of course it had been done on purpose with the intent to hurt. Although it was not intentional on my part, I realized that I had hurt my mother because of what I had done. Accordingly, for the first time in my life I experienced shame, which the dictionary defines as being the painful feeling of humiliation or distress caused by the consciousness of wrong or foolish behavior. Prior to this “event” I was as one with my beloved mother. Shame led to embarrassment and in my embarrassment I withdrew from her. The bond between us was broken. And both of us were hurting. Then something happened to restore that bond. In my tender little child’s heart I knew I needed to go to my Mom and tell her that I was sorry that I had made her cry. A few days after the “episode” I went to her somewhat reluctantly and said that there was something I needed to tell her. Being wise to my ways, I’m sure she thought I had broken something or had gum stuck in my hair, yet again. Although it took a bit of courage, I whispered the words: I’m sorry I made you cry. Wouldn’t you know it, she started to cry again. But this time I wasn’t devastated; I was relieved, because this time the tears were not of sadness, but of happiness. My Mom immediately told me that she too, was sorry that she made me cry. Although we didn’t say it, we both knew that each of us had forgiven the other. It was a wonderful feeling when we hugged each other and the bond between us was restored. When I became a young adult, I set off to conquer the world. Life was a great adventure. Through all my comings and goings, it never entered my mind that I was capable of doing something wrong, such as breaking the law or doing any of the awful things that other people did. My intention was always to do what pleased my self, as long as it didn’t hurt others. And so I maintained my innocence. I bopped merrily along, doing and saying lots of ‘not nice’ things and making wrong choices, hurting no one, or so I believed, but myself. Gradually, however, through many and varied life experiences, a crack appeared in my self-righteous armour and it slowly but surely dawned on me that I had, in fact, done many things wrong that indeed, had hurt others. Not only that, I somehow finally came to realize that I had also done wrong in the eyes of God. Once again I experienced the awful feeling of shame. This time it was not the shame of an innocent child. Rather, it was the dark shame of a responsible adult who now stood convicted that the wrong she had done often was done deliberately and without the slightest consideration for the feelings or needs of others. With this shame came both the knowledge and the acknowledgment that I deserved to be punished. Each and every one of us has at least one time in our lives done something worthy of punishment. To think that someone else would take that punishment on our behalf is almost beyond comprehension. But that’s what Easter is all about, isn’t it? This lovely song that sums up the reason we celebrate Easter in a beautiful and meaningful way that truly touches my heart. I hope it will touch yours, too. 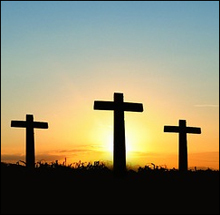 Here are links to three articles (there are thousands more) that explain the Easter story so much better than I ever could.